This article outlines how to configure the CRM Built-in Special Pricing. Before you start configuring the CRM Built-in Special Pricing it's important to know whether this functionality is right for your business. If you're using special pricing setup in your accounts system & it's working for you, then you should continue using this form of special pricing. However, we understand that this isn't the case for everyone & some accounting systems do not offer special pricing functionality. In addition by having the special pricing managed via the CRM, it saves your sales team having to switch between two different systems, so again the CRM Built-in Special Pricing may be of benefit to your business. To configure your Special Pricing you will require Prospect 365 Administrator rights, if you require these then please speak to your key CRM user or our Customer Services Team. To start configuring the Built-in Special Pricing you will need to turn it on. Firstly, navigate to the Settings by clicking on the settings icon in the bottom left-hand corner. Once within the Settings Centre, navigate to the Products and Stock section & scroll down until you reach the ,Built in Customer Pricing & Discounts' configure option. By default this option will be set to Use Accounts/ERP Pricing, to use the CRM Built-in Special Pricing click on the 'Use Prospect 365 Pricing' button. You will then be presented with the option to 'Click to Configure Price Bands', this will open the configure window for Price Bands. In the screenshot below we can see there are already two Price Lists setup; Gold Partners & Trade Customers. 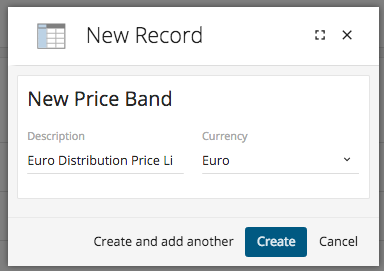 For this example we're going to add a further Price List called Euro Distribution Price List. To add a new Price List click the plus icon in the top right-hand corner. Here you can describe the new Price List that you're adding & the currency that the special prices will show in. Once happy with the information entered click create. To continue setting up special prices for this new Price List click on it's description. By clicking on the description the Price List will be open on the main details page. The main details page will show you the description of the price list, currency & who created this price list. You can setup special prices using two different methods; Category Prices or Product Prices. 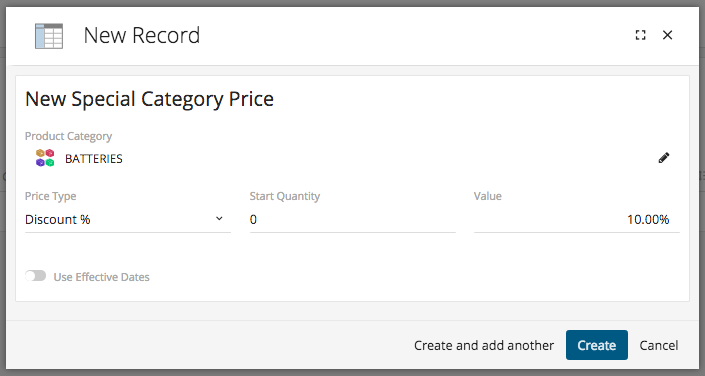 If you have defined product categories setup within the CRM & need to apply a blanket special pricing to all products within the category, then use the Category Prices method. Alternatively, if you just need to setup special prices for individual products in different categories use the Product Prices method. This article will show you how to use both methods. To start setting up special prices for product categories click on the Category Prices page within the Price List. From here click on the plus icon shown in the top right-hand corner. By clicking on the plus icon a product category search will appear, within here you can search for the category that you wish to setup a special price for. Within the example below we're going to setup a special price for our Batteries Product Category. Once you have found the required product category click on the Select button. Price Type - There are three different types of special prices that you can setup; Cost + Margin %, Cost + Markup % & Discount %. What option you choose will define what % value you enter within the Value field. Start Quantity - If a start quantity is entered the sales ledgers associated with this price list will only benefit from the special price if they purchase the set minimum start quantity. For example, customers may get a better price if they buy more of a product. If there is no need for a start quantity just leave as zero. Value - This will be the % amount that will be applied to the product's price. For example if you selected the Discount Price Type & entered 10% within the Value field, all products within the category will have a 10% discount applied. Finally, you can set Effective Dates which is helpful if this special price is only going to be available between certain dates such as a limited promotion. If you do not set an effective date then this special price will run without an end date & you would need to remove it manually if expired. Once happy with all information entered, click create & this new product category special price will be added to the 'Euro Distribution Price List'. To start setting up special prices for specific products click on the Product Prices page within the Price List. From here click on the plus icon shown in the top right-hand corner. By clicking on the plus icon a product search will appear, within here you can search for the product that you wish to setup a special price for. Within the example below we're going to setup a special price for our Industrial Alarm System product. Once you have found the required product click on the Select button. Price Type - There are four different types of special prices that you can setup; Cost + Margin %, Cost + Markup %, Discount % & Fixed Price. What option you choose will define what type of value you enter within the Value field. Value - This will either be the % amount that will be applied to the product's price or the fixed price value depending on which Price Type has been selected. For example if you selected the Fixed Price Type & entered 40.00 within the Value field, the product will have a new selling price of £40.00 for sales ledgers who have this associated Price List. Once happy with all information entered, click create & this new product special price will be added to the 'Euro Distribution Price List'. Now that we have setup our special prices, we need to choose customers that this new Price List will apply to. Using the Global Search find the required customers that you wish to have access to this Price List. Once you have the required Division record open, click on the Sales Ledger button within the Accounts Summary section on the main details page. We need to open the associated Sales Ledger as you link Price Lists at this level. Once the sales ledger is open navigate to the Special Prices page & choose the relevant Price Band from the drop down list. As you can see in the screenshot below I can choose Euro Distribution Products from the drop down list. By choosing this price band, any divisions with this sales ledger will now have access to the special prices we setup. You will notice on the Sales Ledger Special Prices page that you can also setup special product & product category prices for this one sales ledger. Please note that you wouldn't be able to use these special prices for any other sales ledgers, meaning this would only apply to this particular sales ledger. To setup customer specific special prices click on the plus icon within the relevant special price section & repeat the same steps of choosing product/product category, price type, value etc.